Remember when you were a child, looking forward to being a big adult, capable of tackling all sorts of obstacles in your way? Nobody could tell you no! Eat candy for dinner!? Heck, yeah! Wrestle with your friends until the sun came up? Why not!? Crush your enemies into tiny sacks of crying pillow flumps? Abso… what!? Charge down the weaklings who dared to ruin the ending of final season of your favorite show when you were too busy at work to get home and load it up on the DVR and then pounce upon them and squash them into pancake thin fragments of their former selves, ready to be cooked up on the skillet to ensure your future victories over anyone who dared to post anything on social media again!? … Err… You might need to work out some more frustrations than we initially thought, friend. Not that your complaints aren’t totally reasonable and those … ahh… terrible, terrible people deserve to be punished.But, maybe before we dive right into the physical violence and---did you really want to go right to cannibalism! ?---we could try a different method. Something to help exercise those angry demons in a more productive and healthy way. Naturally, we’re talking about dressing up as a powerful Japanese wrestler and giving your friends a little warning of what they might be facing if they keep up the risky behavior. 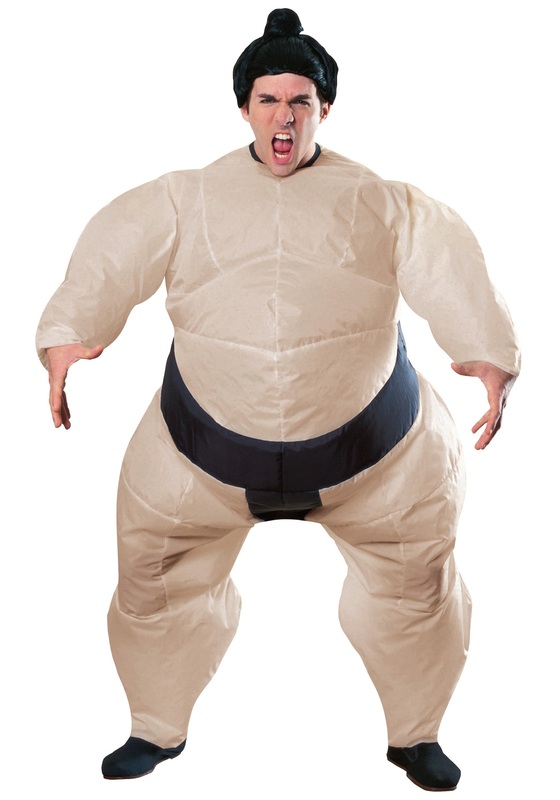 We can help you out with this Inflatable Sumo costume. With the power of wind, you can transform into a larger-than-life ninja wrestler, ready to take down all opponents and take on the persona (and size!) of the hero you always imagined you would be. In fact, you can even grab our kid’s sizes and show your own tyke just what it will be like! Live the fantasy of adventure while you can… and avoid any nasty lawsuits in the process!